The CPA Buried Drum Site is located at the Saipan International Airport, known as lot 026 K 011 Parcel “B”. Located in the village of Dan Dan, the Buried Drum Site is approximately 0.49 acres (21,528 sq. ft.) of land. The site is occupied with dense vegetation and has been undeveloped since the end of World War II. Prior to being abandoned, the site served the purpose of a military airfield and a staging area for aircraft maintenance. Based on a review of historical aerial photographs (circa 1945-46), the site is located in the former location of Isley Airfield and the area at that time appears to have been an aircraft parking area. No other documents were available for review. 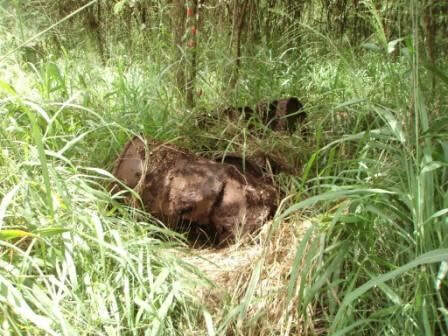 The Division of Environmental Quality (DEQ) previously identified the site as having buried drums, but due to the dense vegetation, it was not possible to identify where these drums were buried. Possible Unexploded Ordnance (UXO) casings were also observed at the time of the site reconnaissance as well. A Phase I ESA was approved and conducted in August 2009. During a site reconnaissance, approximately (25) twenty-five 55-gallon soil-filled rusted drums that were partially buried were discovered. In addition, they discovered (1) one 55-gallon drum containing some waste oil which provides some evidence that the site served as a military airfield and aircraft maintenance area, in addition, the chemicals used for maintaining aircraft contain chemicals that may be of concern. Moreover, due to the history of Saipan, the site has the potential to have un-exploded ordnance within the area. The Phase I ESA was completed in Nov. 18, 2009. Response Status: Approved for Brownfields Phase I ESA in 2009; Phase I ESA Completed on Nov. 18, 2009.